Reprinted in a new and brilliantly colorful edition, multiple Eisner Award-winner Eric Shanower’s Age of Bronze: A Thousand Ships presents readers with the first book in a trilogy leading to the Trojan War. If you’ve ever wondered what led up to the Trojan War, Shanower provides some extremely thoughtful and historically-based answers. Telling the backstory of all of the famous characters we’ve loved and studied over time, Shanower includes more detail on some of our favorite historical names: Achilles, Odysseus, Helen, Agamemnon, and many others. In this new edition, Shanower starts by following a young Paris as he disregards fiery warnings that foretell danger if he chooses to go to Troy. Disregarding the warnings, Paris goes to Troy and finds a life of royalty he never knew existed. He discovers that he is the son of the King and Queen of Troy and is soon sent on an errand by the King to rescue the King’s sister. Instead of returning with the King’s sister, Paris falls in love with and abducts Queen Helen of Sparta. Meanwhile, readers learn the backstories of all the important characters who will play significant roles in the upcoming Trojan War. With Paris traveling back to Troy with Queen Helen, he has no idea he has set into motion one of the most important events in Greek literature. Plot: When Paris decides to leave his country home on Mount Ida for the great city of Troy he sets in motion dark prophecies foretold since his birth. After he abducts the beautiful Queen Helen of Sparta the Trojan War follows. Usually, I like to write lesson plans that contain graphic organizers. Due to the content and nature of Shanower’s Age of Bronze, however, I believe that the best lesson plan to pair with this text is one that offers educators and readers a chance to study some of the Greek Mythology referenced in the story. In order to do so and before reading, it would behoove readers of this graphic novel to know even more about the characters that appear in the story. Thus, educators should place students in small groups and ask each group to research at least 2 of the characters listed above; students should take specific and detailed notes about what they learn about the characters outside of Shanower’s text. Then, while reading, students can compare and/or contrast their new knowledge of the characters with Shanower’s retelling in Age of Bronze. When students are done reading, they can present what they researched alongside what they read in Age of Bronze. This will help students be able to distinguish between multiple interpretations of the main characters. As a loyal and devoted fan of DC, I’ve been looking forward to seeing some of their new DC Ink titles. 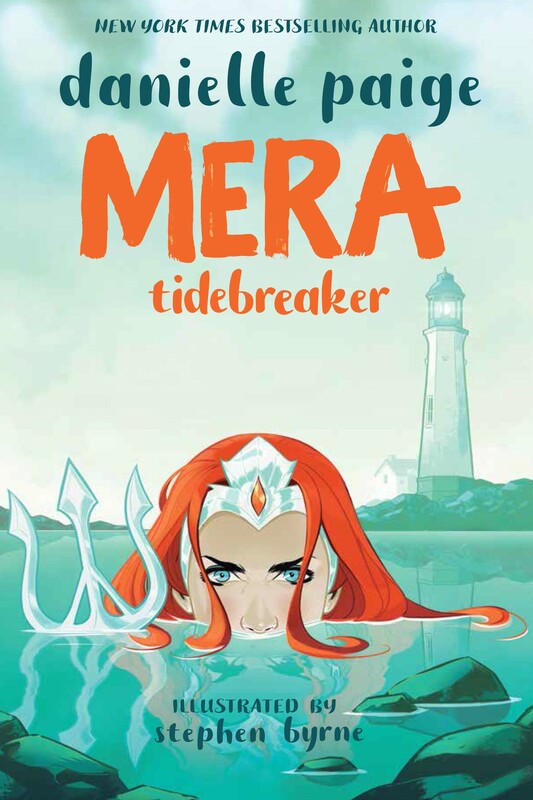 Mera: Tidebreaker delivers with force and energy, having made the wait more than worthwhile. Aimed at young readers, Mera: Tidebreaker offers readers a new, and compelling origin story for both Mera and Aquaman. Mera is born and raised in Xebel, a penal colony ruled over by Atlantis. Expected by her father and the entire kingdom of Xebel to marry and present a new King to rule over Xebel, Mera’s independence and strong will take over. Wanting to follow in her mother’s footsteps and become a warrior for her people, Mera isn’t so sure she wants to be married to her father’s proposed suitor and fiancé, Larken. After secretly overhearing and watching her father and Larken plan an upcoming attack on the Atlanteans, Mera decides to not only take matters into her own hands, but also wear a crown of her own choosing. Emulating her famed and beloved warrior mother, Mera secretly heads to the shoreline beaches of Atlantis to prove that she is both mentally and physically strong enough to rule over Xebel. Her plan: Kill the young and incoming King of Atlantis, Arthur Curry. In order to do so, Mera must face some personal and royal challenges she did not expect, and that’s when her plan to kill Arthur Curry becomes more and more complex and riveting for all readers. Plot: A teenager from Xebel, a penal colony ruled over by Atlantis, Mera is supposed marry the man of her father’s (King of Xebel’s) choosing. A strong-willed young warrior herself, Mera feels a bit differently, much like her famed warrior mother, and wants to prove that she can wear a crown of her own choosing. There are many complex and intriguing characters that play a role in Mera’s origin story. Below is a “character tracking line” that allows readers to link Mera’s origin story to some of the key characters that play a role in informing her story. Readers should fill in these spaces with details as to how each character informs Mera’s storyline and decisions.